The 11th edition of Monaco Classic Week concluded this weekend with 57.8m sailing yacht Creole, helmed by Allegra Gucci, receiving the Monaco Classic Week Trophy. The classic yacht event saw 58 sailing yachts in attendance, 10 of those being 'big boats' coming in over 30 metres LOA, and 37 powerboats including 20 Rivas, as well as 29 12ft dinghys racing together in Monaco for the first time. 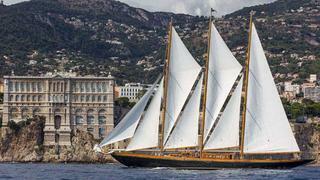 Launched by Camper & Nicholsons in 1927 as Vira, Creole was recognised for her return to racing in Monaco after a 20-year absence. She is the largest Camper & Nicholsons ever constructed and her Bermudan schooner rig allows her to be sailed with a limited crew. She was rebuilt in 1958, and then purchased by Maurizio Gucci in 1983, who had her restored back at Camper & Nicholsons between 1984 and 1986. A regular on the Mediterranean regatta scene, she is based in Palma over the winter and used by the Gucci sisters during the summer months. As for the big boat regatta winners, Elena of London took first place, Moonbeam of Fife came in second and Mariquita took third. Other notable awards included the La Belle Classe Restoration Prize going to Nan of Fife and Concours d'Elegance going to 15m IR Regatta winner The Lady Anne. The Monaco Classic Week also included a chef's competition with Alain Ducasse as jury president, which was won by Creole's chef Juan Munoz. New to the week was a cocktail competition, judged the same jury, and won by Pacha III. Date's for next year's Monaco Classic Week have already been announced, with the bevy of classic yacht beauties set to descend on Monaco 9-13 September, 2014.